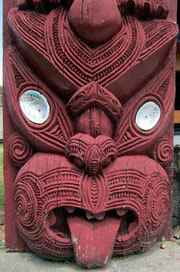 Journey in the North Island (26 nov 2013 – 28 apr 2014) - oN Ze trail ! After about 3000km ridden in this wonderful country, we've got so many great memories and new friends. We've always seeked permission before to cross private land (of course! ), and most landowners and farmers have been very, very good to us. We're very grateful to them, who let us ride through their land, and to those who welcomed us to stay with our horses on the way. Without them this cross-country journey couldn't be. Thanks to them we get to know the real New Zealand. We're also very grateful to Tony, from Canterbury Horse Trail Riders, who helped us a lot to built our itinerary in the South Island. In the North Island, Yakov and I pushed our way forward through the East Cape region, discovering the maori culture and the local lifestlyle. Yakov stopped at Gisborne and I went on towards Hastings. To avoid main roads, I took the slow way, passing by lake Waikaremoana. Then I followed the East Coast down to Castlepoint. The last leg was to reach Levin, on the West Coast, where Wiki spend the winter (at Riding for Disabled). The South island is quite impressive, with some saddles at 2000 meters high, and people living dozens of kilometers apart from each other. But its mighty rivers and mountains create magic landscapes. From Blenheim we headed for Otago. In this region are held the cavalcades, a re-enactment of the 1860s gold rush, which gathers hundreds of horses and wagons. But as we were getting close, due to the drought (the worst in fifty years), we had to change our route to find good grass. We didn't make it to the Cavalcades and ended up in Queenstown instead, which was lucky because the horses found the best of homes there.